Prof. Nikolaus (Nik) Hafermaas is an international award-winning artist, designer and educational leader who returns to TRIAD Berlin as Creative Director in June 2018 in order to focus on the further international development of two important growth areas: mediatecture and new digital experiences. 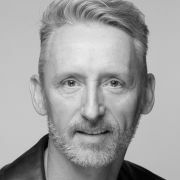 Nik had initially joined TRIAD Berlin shortly after its formation in 1995, soon becoming Chief Creative Officer and principal partner. During his tenure, he helped create the inaugural TRIAD exhibition project “The Dream of Vision” at Gasometer Oberhausen, pavilions for the World Expo2000 and for the Swiss Expo02, and many other key projects. Prior to this, Nik served as Dean and Department Chair for graduate and undergraduate Graphic Design at the world-renowned ArtCenter College of Design. He will continue his affiliation with ArtCenter in his role as Executive Director of the school’s Berlin satellite program ArtCenter Berlin, where he fosters future-forward global collaborations and transdisciplinary programs based in Berlin. While in Los Angeles, Nik founded Ueberall International, an artist platform which conceived and produced mediatecture installations converging digital media and spatial experiences. A former AIGA national board member, he is a regularly featured speaker at design conferences across the globe, such as the IFA+ Summit in Berlin, the VOR Summit in Mexico City and the Create Change forum in Beijing. His work has been recognized with international design awards from AIGA, One Club ADC, The Industrial Designers Society of America, IDA Design Awards and most recently the Society for Experiential Graphic Design (SEGD) and is regularly featured in publications and exhibitions. Nik graduated from the University of the Arts in Berlin, where he studied visual communication and architecture, later completing the Executive MBA in Creative Leadership at the Berlin School of Creative Leadership/Steinbeis University.